This sassy bag is a total speed dial to cloud nine that I'm super over the moon to have in my life. From the masterworks of magic that are Skinnydip London, this Piper Cross Body Bag is such a cute addition to any wardrobe be it the season of romance or not. Pssst, I've also got an outfit post planned for the future that features this gingham playsuit below. I've been wearing it religiously of late, and I can't wait to show you guys the outfit post in all its gorgeous glory. I rock this red outfit all the time come rain or shine, it's my "outfit" for instantly feeling uplifted, encouraged and confident when I need a bit of a boost. If you read about our trip on the hot Pink Hamble Ferry then you'll know all about this outfit. 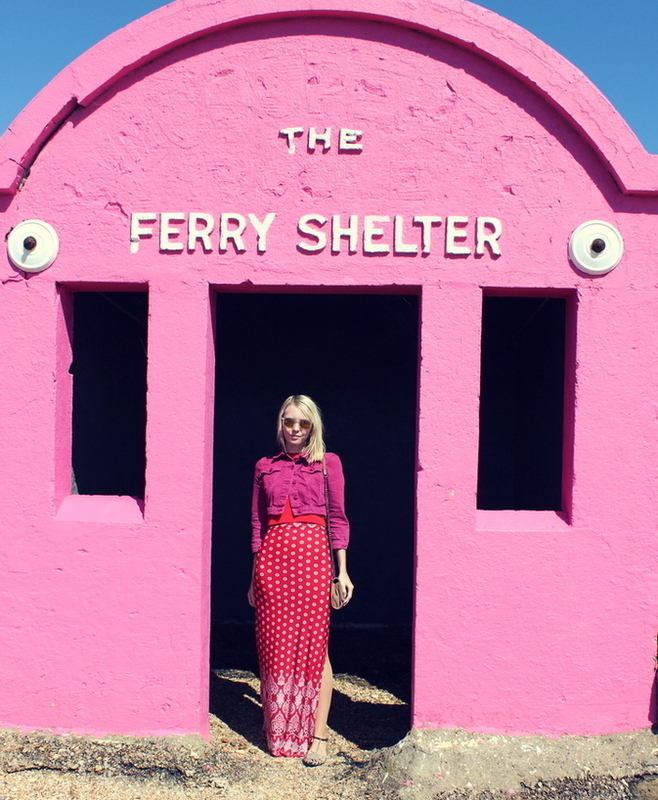 It matched perfectly with the powerful pink Ferry Shelter and as you can see, I felt right at home amongst all the hot pink heaven. Probably my favourite pair of shoes, these shimmering beauts have been a romantic twist on many a beachy outfit and added a bit of gorgeous glitz to sass up the sand. I've also bought the same version of the heels in white, and you can see them in their full glory in this previous outfit post. Motel Rocks are one of my favourite brands for sequins and shimmer, and their romantic vibes are forever first on my hit-list. 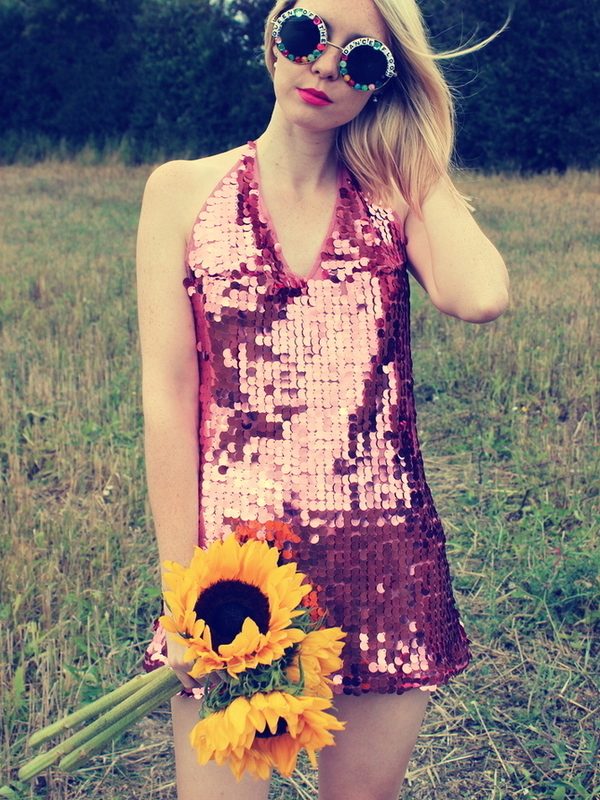 This pink sequin metallic rose dress is still on the Motel Rocks site amongst many other glittery gorgeous wares. The Skinnydip siren's going off again you say. Hell yes it is. 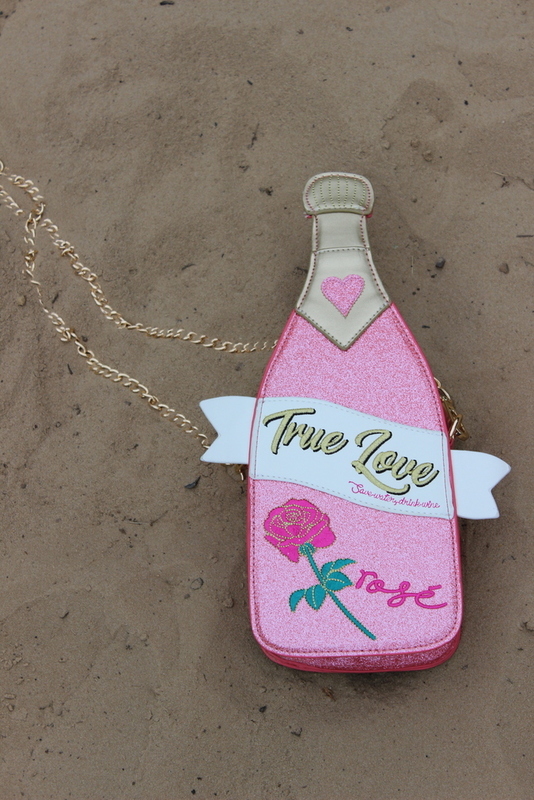 Drink this in; a pink champagne bottle bag that you can swank around in town with? Have you ever heard of anything so extra? This bag was bought after a bubbly lust for it broke to the fore and I decided to go ahead and add it to my quirky collection of bags. Like any Skinnydip bag, it's a fabulous bit of fun to have and to hold, and I definitely intend to show it in many more an outfit post. Ahh, one of my sure fire favourites. Sugary sweet and the perfect scoop of dreamy, this dress has marked one of my favourite outfit posts in the past. Okay it's not all hearts and flowers, but an ice cream date with extra sprinkles is always a love match, right? These magical mom jeans with glitzy embroidered red hearts are denim dreamy and cuter than Cupid. From one of my favourite stores, Liqour N Poker, they also come with black hearts and are of course, hot to rock any season you like. I featured these jeans back in an outfit post last September and sorely regret not saving them for a Galentine's outfit post. But hey, the whole point is they're stunning every season. How are you celebrating Valentine's/Galentine's this year? No matter what I always think February 14th calls for chocolate, a bubblebath and a girly shopping trip! You truly do have love in the air in all your colorful and cheerful outfits Sophie! 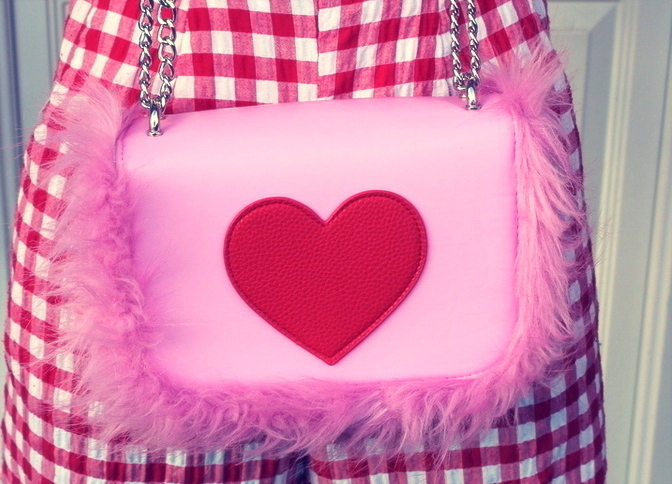 I adore that heart shaped bag, it's so cute with the fur around it. Wearing pink and red together is the best! My V-Day post last year was a pink top with a red skirt. I may just post it on Insta this year! Those colors are just warm and make me feel good always. Your outfit with the long skirt is my fave because it looks effortless, and layered (two of my favorite things.) You look adorable in all of the outfits with your gorgeous self. Happy Valentine's Day babe!!! Love these outfits, they are extremely fabulous! You look super beautiful! I love the design and how girly it is,. Skinnydip really have such awesome and unique pieces. I just love that "true love" bag. Super cute and fun. Also those ASOS heels are gorgeous. I too remember growing up hearing how red and pink don't go together. Same with florals and stripes. I remember once when we were overseas my cousin and a friend talking about this by the pool and I got wet and had to change my clothes. All we had on us was a floral wrap skirt and my mums red stripe tee. I didn't feel like they looked bad together but I remember feeling so self conscious because of it. Today though, that is one rule I love breaking. I loove pink, and these items are all super gorgeous! I love the glitz and the glam of these items, and the last image with the red heart jeans and the pink bag are super pretty - never have red and pink looked so good! 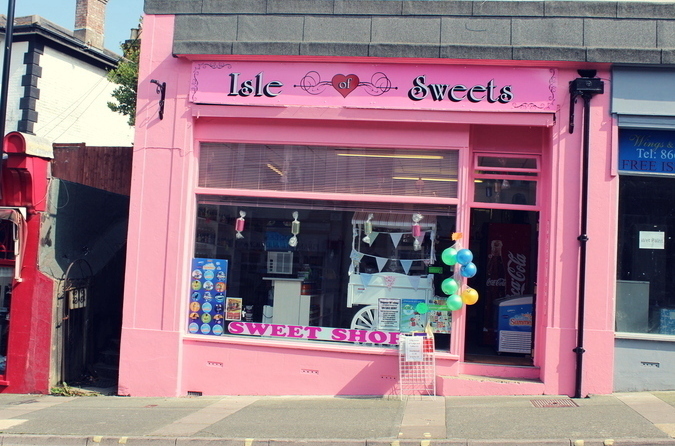 Love this post and all pink in it. Can't get ovr it! Oh my gosh gorgeous, I am so all over these looks. I remember when red and pink was seen as a total no-go, and this embracing of the super sweet combo is everything I could want and more - particularly as my love for them has grown :') You always pick the best pieces from Skinnydip, lusting over that rose bag... But I think my heart really lies with those jeans - all over those sequins, especially paired with those super cute heels. Those jeans are so cool!! You really pull them off and make them look ... cool! I love how your style is so interesting.